It’s easy to overlook the importance of your teeth until they’re gone. At that time, it quickly becomes evident how vital they are to maintain excellent oral, psychological and overall health. The best solution for missing teeth is the placement of dental implants in Colorado Springs. Before undergoing the process, though, here are 5 important questions you should ask your dentist. Question #1 – What is a Dental Implant? It’s a titanium post that is surgically inserted into your jawbone. Over time, a somewhat magical process will take place, where your existing bone will fuse with the implant through a process called osseointegration. The sturdy and sound foundation created will then support a final restoration (crown, bridge or denture). Question #2 – Will the Procedure be Painful? Don’t feel ashamed to be concerned about any discomfort. After all, that’s a concern of most people undergoing dental surgery. By administering anesthesia, your implant dentist allows for a painless process. Then, any discomfort after the procedure can usually be managed with an over-the-counter pain reliever like ibuprofen or Tylenol. Question #3 – How Much Do Implants Cost? The price of dental implant placement can vary greatly. That’s because this form of teeth replacement is highly-customized. Therefore, to receive an accurate quote, you’ll need to visit your local dentist for an examination and consultation. Based on your needs and the current condition of your oral health, a price will be generated for fully restoring your smile. Question #4 – What Happens if I Don’t Replace My Missing Teeth? To get a glimpse of what happens if missing teeth aren’t replaced, let’s consider how the teeth normally function. They are held in place by a healthy degree of shared tension. Therefore, when even one tooth is missing for a prolonged period of time, the surrounding teeth can begin to shift or protrude from the gums. As a result, there can be severe gum infection and improper occlusion (bite). Question #5 – How Long Do Implants Last? Before investing in dental implants, it’s definitely a good idea to ask your dentist how long they should last. You’ll be happy to find out, though, they can support your jawbone and overall oral health for up to a lifetime. Now that you’re better informed about what to expect from the dental implant process, the next step is to reach out to your implant dentist to schedule a consultation. 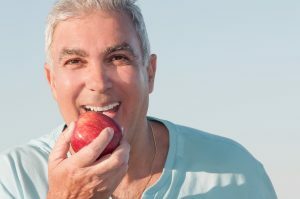 Then, when you have your missing teeth replaced, you’ll once again be able to eat the foods you love, speak with more clarity and smile with confidence. Dr. Karl Lackler and Dr. Geoff Haradon combine their decades of experience and advanced knowledge in periodontology to help patients regain normal lives. They replace missing teeth and restore smiles with dental implants at Rocky Mountain Periodontal Specialists, LLC. To learn more about their services or to schedule an initial visit, you can contact them through their website.